The first conference held at the Trincomalee police headquarters where representatives of peace committees, religious organizations and village level officers (Grama Sevaka officers) participated. Presiding over the conference, Senior Superintendent of Police Mr.Upali Hewage said incidents daily taking place in Trincomalee and Kinniya division have caused deep concern over the maintenance of law and order in the district. Mr.Tharman speaking and seated are ( L-r) SSP Hewage, SLMM acting head Kurt Spur, and Attorney-at-Law Mr. K. Sivapalan. He appealed to leading citizens and religious leaders of the town to act with responsibility and assist the law enforcement authorities to bring the situation under control. Religious leaders of all faiths in their speeches said the elements behind violent incidents taking place in the Trincomalee district should be identified to sustain the peace efforts now being taken forward in the country. At the second conference held at the Trincomalee office of the Sri Lanka Monitoring Mission, Mr.Tharman, the Trincomalee district head of the TEEDOR (Tamil Eelam Economic Development ORganization) participated on behalf of the Liberation Tigers of Tamil Eelam, along with the Kumburupiddy area LTTE political head, Mr. Sivakumar. SSP Mr.Upali Hewage and army officials and village level officers also participated. 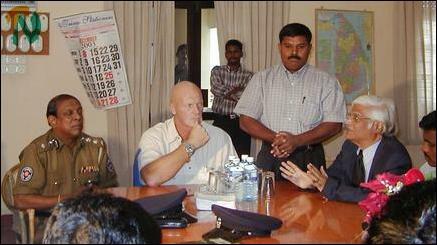 Trincomalee SLMM's acting head, Mr.Kurt Spur, presided. Mr. Hewage said that no one should be allowed to disturb the peace environment now prevailing in the cosmopolitan district where all three communities live with harmony. He added that Trincomalee has become the cynosure for all parts of the country. Therefore the media should act with responsibility when reporting on the events taking place in Trincomalee. Mr.Tharman on behalf of the LTTE brought to the notice of the law enforcement authority that some groups in the Kinniya area had blocked the supply of relief food items to the displaced Tamil families in Alankerni and Eechantivu. This had taken place in the army-controlled areas. The law enforcement authority should inquire into this and take appropriate action to ensure the smooth supply of relief food materials to the displaced Tamil families there. Mr.Tharman further said,"We have been deeply committed to the peace process. Some elements are working against the current peace process. It is the duty of the law enforcement authority to act fast to identify those anti-peace elements and take action against them." The acting head of the SLMM in Trincomalee district, Mr.Kurt Spur, presiding over the meeting said, "one thing has become clear and that is some elements against the peace process are working hard in Trincomalee to cause dissension between two communities. We should not give room for them. Leading citizens of the two communities should come forward to work for the harmony."